The Marine Corps Way of War examines the evolving doctrine, weapons, and capability of the United States Marine Corps during the four decades since our last great conflict in Asia. Unfortunately, due to sales rights restrictions, we cannot offer The Marine Corps Way of War for sale in your country. The Marine Corps Way of War examines the evolving doctrine, weapons, and capability of the United States Marine Corps during the four decades since our last great conflict in Asia. 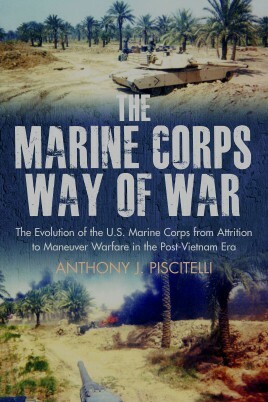 As author Anthony Piscitelli demonstrates, the USMC has maintained its position as the nation's foremost striking force while shifting its thrust from a reliance upon attrition to a return to maneuver warfare. In Indochina, for example, the Marines not only held territory but engaged in now-legendary confrontational battles at Hue, Khe Sanh. As a percentage of those engaged, the Marines suffered higher casualties than any other branch of the service. In the post-Vietnam assessment, however, the USMC ingrained aspects of Asian warfare as offered by Sun Tzu, and returned to its historical DNA in fighting "small wars” to evolve a superior alternative to the battlefield. The institutionalization of maneuver philosophy began with the Marine Corps' educational system, analyzing the actual battle-space of warfare—be it humanitarian assistance, regular set-piece battles, or irregular guerrilla war—and the role that the leadership cadre of the Marine Corps played in this evolutionary transition from attrition to maneuver. Author Piscatelli explains the evolution by using traditional and first-person accounts by the prime movers of this paradigm shift. This change has sometimes been misportrayed, including by the Congressional Military Reform Caucus, as a disruptive or forced evolution. This is simply not the case, as the analyses by individuals from high-level commanders to junior officers on the ground in Iraq, Afghanistan, and elsewhere, demonstrate. The ability of the Marines to impact the battlefield—and help achieve our strategic goals—has only increased during the post-Cold War era. Throughout The Marine Corps Way of War: The Evolution of the U.S. Marine Corps from Attrition to Maneuver Warfare in the Post-Vietnam Era, one thing remains clear: the voices of the Marines themselves, in action or through analysis, describing how "the few, the proud” will continue to be America's cutting-edge in the future as we move through the 21st Century. This new work is must-reading for not only every Marine, but for everyone interested in the evolution of the world's finest military force.